I’ve made a lot of homemade cat food and researched it enough to know how easy it is to get certain things wrong. I’ve been wanting to write this post for a long time, as I see a lot of confusion and mixed messages out there. Serious heart and eye conditions have appeared in cats fed diets containing insufficient taurine. Cats cannot synthesize enough taurine to meet their needs, so taurine needs to be added even to foods that naturally contain some taurine because it degrades so easily (see mistake #3). Better to err on the side of caution with this one! Niacin (B3) and thiamin (B1): These B’s are degraded by cooking, so any homemade food needs to have these added after any cooking or heating (attention anyone who warms raw food in the microwave!). Adult cats deprived of niacin, which their bodies cannot manufacture, will lose weight and could die as a result of this deficiency. Thiamin is also essential because a deficiency leads to blindness and neurological impairments such as seizures and heart-rate disorders. Vitamin A (not beta carotene): Deficiencies in vitamin A lead to blindness. Cats can’t manufacture vitamin A and, unlike us, they can’t synthesize vitamin A from beta carotene. They must get it from their diet, but it’s not present in most foods. Vitamin A is found in liver and egg yolks, so if those are not part of your cat’s regular diet, they will need appropriate supplementation (not too much! see mistake #4). Calcium: If you feed cats meat without a calcium supplement or bones (finely ground in), it can lead to a collapse or curvature of lumbar vertebrae and pelvic bones; bone pain and fractures, as well as hyperparathyroidism. Why is this bad? Because key nutrients won’t survive those processes. Add supplements AFTER cooking, grinding, or pureeing. You need to add taurine after any cooking has taken place. And, even if you serve raw food or food that contains taurine naturally, it is believed that is also degraded to some degree by grinding and pureeing. And, taurine leaches out in water, especially if cooking in hot water, so keep that in mind too. Finally, most B vitamins cannot survive heat and the B’s are essential to your cat’s health too (see mistake #2). An excess of magnesium is associated with stones in the feline urinary tract. Vitamin A, while critical, becomes very toxic when too much is consumed. Too much calcium causes depressed food intake and decreased growth in cats. Excessive vitamin D is also toxic. 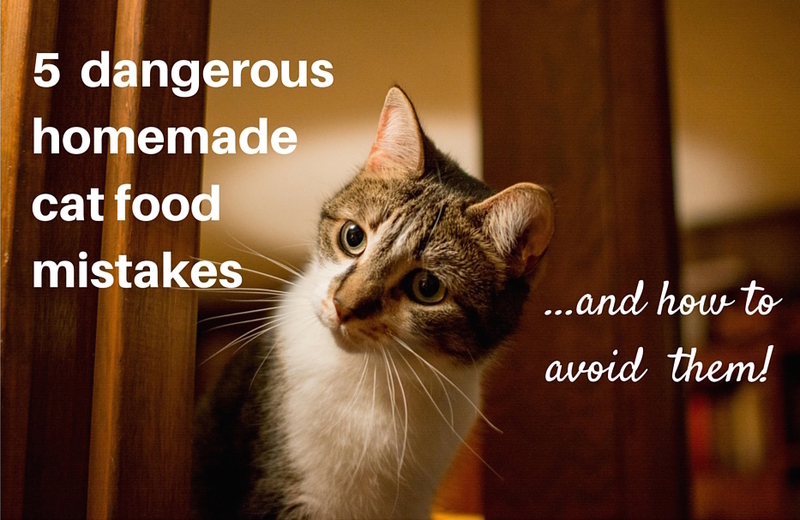 How to easily avoid those homemade cat food mistakes! As you may imagine, after I did a little research and discovered all this, I was daunted. I looked at the amount of time in my day and quickly deduced that I’d much rather buy a reliable supplement mix for homemade cat food (and follow the instructions carefully) than risk winging it. CAUTION: Do not use these premixes (containing calcium) on formulated pet foods! You will over calcify your cat if you do. For same reason, use meats with NO BONES. All ingredients are pure food grade products without silica, magnesium stearate or other processing additives. They do not use any raw materials from China or India. All raw materials are manufactured in the USA, Europe or Japan. Free of controversial chemical additives like BHT, BHA, ethoxyquin and menadione. 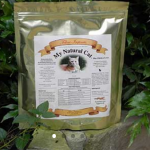 Alnutrin’s site has a wealth of practical, easy-to-understand information on making food for your cat and they offer free formulation advice to customers. They also offer free trial samples! If you’re in Canada or Europe TC Feline may be a good option. I haven’t tried this one, but I’ve heard some folks love it. It uses 100% human grade and pharmaceutical grade ingredients. GMO-free, and no artificial additives, flavors, etc. The premixes are “made in small batches, precision measured, blended, sifted, and packaged by hand in a spotless facility.” The sources of ingredients are carefully selected. For example, it includes grass-fed whey protein from New Zealand (GMO free, rBGH free, BSE free). However, I have question marks around their use of the Arctic Pacific krill oil in the product. I cannot confirm it, but there is concern about eco-system damage from this kind of krill fishing and some are also concerned with a risk of Fukushima radiation contamination in Pacific krill oil. Get TC Feline in the US here. Premixes are not meant to be used as a “sprinkle” on top of meat or added just to water or other foods; Feline Instincts says you can harm your cat by using the supplements that way. Follow the instructions for mixing the right amount into the food at the right time. For cats with constipation, Feline Instincts No Bones About It or Alnturin with Calcium mixes are an ideal option. 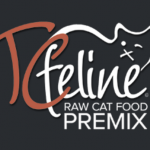 TC Feline also provides a bone-free special mix for cats with kidney problems. Some (but not all) experts say you shouldn’t use store-bought meat (unless you cook it before adding supplements) because there are concerns about bacteria. Instead, they say you should grind your own or order from source that freezes immediately after cutting or grinding, like Hare-Today, which carries many types of meats. 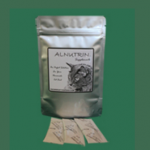 Alnutrin provides an excellent homemade cat food nutrient calculator to create your own new recipes or to customize one of theirs. You can also use it if you already have a recipe and would like to know what the nutritional composition of the diet is. The homemade cat food supplement companies listed above will provide you with what you need to know for making your cat food. But if you’re really wanting to geek out and learn more about doing it all from scratch, see Dr. Lisa Pierson’s HUGE page on the topic of making cat food here. Wanna see how to make, prepare, and store a batch of cat food? This video from Feline Instincts shows you exactly how to prepare and package a batch of homemade cat food that’s supplemented with a premix. Demystifies it! anyone you think could benefit from it! hello again, does this cat food contain taurine and bones? Hi I loved reading this article! 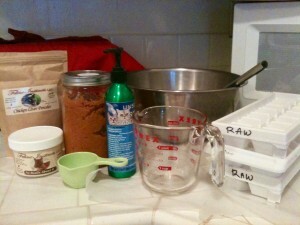 I am very new to making cat food homemade and i’m just researching now, but planning soon to take the plunge to start. Just wondering, should I meet with their vet with my cats to discuss what I should be adding into their food? I’m worried the vet we have now won’t take me seriously or take the time to help out. Thank you! Hi Liz- I really need your advice! I have been using Lisa Pierson’s cat food recipe, from catinfo.org, for my 5 year old male cat for about a year (he had bladder crystals/stone before, and since feeding him homemade food, the problem has gone away!). But now his cholesterol is CRAZY HIGH– somewhere in the 400’s. The vet thinks it’s because of the liver in his food and wants me to put him back on Hill’s prescription diet (there is no way I am doing that!). Do you have any advice, or maybe an altered recipe I can start making? We don’t know for sure whether the problem is genetic or not.. but I am really scared now that I’ve maybe done something wrong to make him sick. Please help! Fabulous article! I’m looking for kidney support recipes to feed my aging cat who’s in beginning stages of kidney disease. I came across a recipe, but brown rice is included, and after reading your article, I’m wondering if you have an alternative recipe? I made homemade dog food for our aging lab and her health improved drastically. Looking to do the same for our felines. Any info would be greatly appreciated! 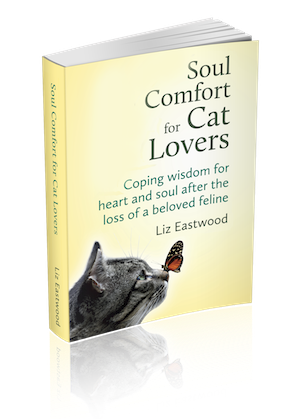 Hi Liz, I was searching for homemade cat food recipes online and came across your article. I really like it and would love to introduce it to my 3000 followers on weblog. Do you mind if I translate it into Chinese? I’ll put reference and add your blog’s url. Great article, this is exactly what I was looking for! 2) how much time will it take to thaw and get to room temperature after taking out of the freezer? (I don’t want to heat it at all) should I immerse the zipper pouch/ container in warm water to bring it to room temperature? Will it spoil the enzymes in meat or the vitamins/taurine? 3) is EZfood for cats a good product? 4) is it ok to use rabbit+turkey meat combo when preparing a batch? If so what should be the ratio? And what should be the proportions of meat:supplement powder for a monthly batch? Please reply, I could really use your advice. Hi, I am looking to feed my 2 cats Cooked homemade food. Can these supplements be used with a cooked recipe as well or are they specifically for homemade raw food? If they are not for cooked recipes could you direct me to some that are if you know of any? Thanks in advance. The mix I know of that has clear instructions for using with cooked food is EZ Complete — a newer one that I’m excited about: http://www.foodfurlife.com/cats.html And honestly I think cooked is a good way to start until you can be sure about how to work with raw in sanitary manner. Hello Liz, I’m taking care of a wildcat. I usually cook stew for it, about 1 month it eats a lot, but gradually it does not eat as much as the first month anymore. Did I do something wrong? I have been feeding human grade canned and kibble. Two cats, I go through a large can in three meals. I have been re-heating in the microwave, and from what I read above I’m destroying the B vitamins by doing that. I eat out of the microwave myself and have also recently been contemplating that is not such a good idea either. My patter is cook huge batches, divide into portions, and at meal time (for myself) reach in the freezer, take out what looks good at the time, heat in microwave, and eat. But I take vitamins and minerals…. How can I quickly heat refrigerated canned food without getting a pan not only dirty but probably crusted with food? I looked at steam ovens but it appears they have a problem with mold. I’d love to cook for my cats but I want to improve their situation, not make it worse. Their formulas look ok but I myself wouldn’t go with them. I try to feed paleo (only meat and necessary vitamins) and theirs is not. They include fillers (albeit “natural” ones) including carb-heavy peas and veggies, neither of which offer real nutritive benefit and only add weight to inflate cost/volume. Can I use taurine powder and whey powder in cooking and baking to make my own cooked cat food? they will eat can food everyday so my goal is not the nutrient of it. my goal is to have a bit of binding powders to make soft baked cat kibble once a week. most recipes I have seen are using grain and wheat powder, flour, ect to bake. I would like to use whey and taurine powder and make very soft moist kibble once a week. Just don’t know if cooking taurine and whey powder brings out toxins in it for cats? Susanne, I don’t know about whey powder, as I haven’t looked into it, but I do think you need to be sure to add taurine AFTER cooking, as cooking degrades it. I don’t think it would be toxic – just not fully available for the cat’s body to absorb effectively. Thanks for this info! I needed to switch my cat’s food as he was throwing up anything else I tried, but he has not taken to raw food, so I have been cooking the ground mixture with a bit of chicken broth (I use thigh meat, beef heart, chicken liver, egg yolk, salt, and chicken egg shell (because he did not do well with the bones either), and Platinum Performance cat supplement.). It seems I should add the supplement after cooking the food. Is there any other downside to cooking the food? What would you recommend? Can one include whey protein as a supplement in or on cat food? I see some say yes some no and have found it in a few cat snacks. Can you settle the debate of safe or not? I have yet to find a commercial human-grade grain-free cat food that does not have chemicals in it that I refuse to feed my cats. I myself eat “above” so-called human grade because I won’t eat those chemicals either. Why would I feed my cat meat that is from animals who ingested Roundup all the time? That is human grade….you eat Roundup all the time too, if you buy your meat at the grocery. I also have a 7 yo male cat who’s had struvite crystals. My vet says I should only feed him a special diet for urinary issues – currently Royal Canin SO – but it bothers me so much when I think about what he’s actually consuming every day, that it may be harmful and shorten his life. I’m very confused and would appreciate any insight. Hi, my cat has had struvite crystals in the past. Would you feed this to a cat of your own if it had crystals, or would your u change the recipe at all? Love your demo of making the food,really does look like I can manage this in my busy life! Thank you . What about U-Stew? This food additive is added to the cooked meat of your choice to make up a complete meal. Like the fact that it is all human grade and none of the additives are from China. Do your cats enjoy eating cold food from the fridge? How long can it sit safely out of the fridge so it gets to a more palatable temperature? I’m thinking of making small batches here and there as a treat. Thanks! do you think its an adequate supplement?Thanks! I feed my cats Bravo canned food and alternate with a raw turkey preparation I mix with diluted in water Honest Kitchen Grace, the latter being a complete food in dehydrated form, to make sure the raw turkey meals are more balanced. I am wondering if this is enough in terms of getting the right nutrients for my kits. I rotate these foods daily, sometimes I sprinkle Brewers yeast and or dehydrated chicken or turkey treats on top to make the food more interesting. Liz or anyone else who is knowledgeable of proper kitty diet do you think I am covering pretty much their nutritional needs? Or shall I be aware of something that may be missing? If I was to cook the meat (beef or turkey) before adding the supplements (my cat has been on raw much of his life but can’t be on it right now), does this change how long it can be frozen (vs. raw)? Also, any idea if the AAFCO nutritional value for Feline Instincts is based on raw meat with enzymes, or would it still be AAFCO certified with cooked meats? Here is the link to the nutritional website in case that helps. I have been feeding my cats Darwin’s Natural Pet Products and my male cat was recently diagnosed with hyperthyroidism. Is it because he is not getting enough nutrients and if so, what should I be giving him. He’s a 12 lb tuxedo and recently turned 17. He’s always been very active but lately, he looks bloated and not sure he is going #2. What to do? I have came across your blog today and I want to congratulate you on a beautiful blog you have and it’s very easy to understand. As I was reading this article I realize that I made a very big mistake I’ve been feeding raw for five months now and I was putting my vitamin B in to boiling water to dissolve the pills, I see that I was destroying the vitamin B by doing this, I have two months worth of food in my freezer, is there anyway I can save all this food, is it possible for me to get the vitamin B in powder and to add it into each container every day as I feed the cats or is it dangerous that I overdose on vitamin B if I do that ? would you have any suggestions for me not to waste all this food ? Thank you Mona! I totally understand not wanting to waste all that good food. What I personally would do is mix in a “pinch” (like 1/10th of a capsule) *per cat* of Jarrow B-Right for each meal. I just eyeball the amount — B vitamins are water-soluble so excess will pass out in the urine and overdosing is extremely uncommon. I use that particular vitamin because it’s so pure and doesn’t have other minerals, vitamins, herbs, or fillers added. Hi Liz, thank you for answering, I am very happy That I can turn this around easily. I was scared when i read this. Looking forward to visiting your whole blog. I will try and find this in Canada if I can’t the health store will guide me through the purest they have. You are welcome! One thing that helps in your case is that you are feeding raw, not cooked, so *some* level of B-vitamins inherent in the raw meat itself will still be viable – in other words you haven’t been feeding completely B-free. the amount of avidin in a raw egg white is easily overwhelmed by the b vitamins within the egg yolk. if you are using the entire egg, this is not really an issue. A new supplement on the market that may be worth adding to this list is FoodFurLife designed by well-educated and experienced raw feeders. (really not recommended for long term use – using real bone is better) ” unless your cat has chronic kidney disease. I personal ground my bones and add the vitamins Dr. Pierson suggest. I placed an order with foodfurlife and the cost of the product is very high plus the fact that I paid over six dollars for “priority mail” thinking I would receive the order in a day or two. Three days later I called foodfurlife and explained that I had not received the order and was immediately told by the person who sounded offended by my call that I could get a refund. I had not been rude but simply trying to find out if something had happened to my order but the person on the phone behaved as though I had somehow insulted her. I asked what is meant by priority mail and she came back with a smart curt remark. I asked her if I could speak to someone else and she told me she was part owner. I’ll never do business with this company again. She also told me that my order had been mailed that day, three days after I had placed it. So much for the 6 dollars and the priority mail. It doesn’t seem to be a priority with them. Jasmine, I’m so sorry for your atypical experience with our company. Regarding the cost of shipping, most companies charge shipping & handling. We charge no “handling” fee, and as a small (but growing) company, our volume is not yet to the level that we get shipping rate discounts. In fact, we subsidize the cost of USPS Priority mail shipping. “Priority Mail” refers to the particular delivery service through the United States Postal Service. Our shipping FAQs state that we typically ship within 1 to 2 days of when the order is placed, and that is the case. On the rare occasion we don’t meet that. We are a small company with just the two of us. We get sick, our pets get sick – sometimes “life” happens. Of course there is no excuse for rudeness in customer service, and for that I can only apologize. That, too, is atypical, as it is our goal to provide customer service and care at the level we would like to receive. As to the cost of the product? Please bear in mind that all ingredients are human grade, non-gmo, and it is manufactured in a human neutraceutical facility that is a next generation cGMP and NSF certified manufacturing facility. Unlike any of the other premixes, ours is based on the prey model, contains two organs, and has the full daily recommended amount of omega 3 via NZ green lipped mussel powder, it is not a token amount. In the end, the cost depends on the purchaser’s cost of meat. If one can pay $3.99 or less for the meats used in the food, the cost of using EZComplete to make food costs about the same as using Fancy Feast to feed one’s cats. Just curious. Is there a reason you didn’t include wysong call of the wild? Since it’s one of the more popular raw food supplements out there. Good question. The Wysong Call of the Wild supplement says “For intermittent or supplemental feeding only” on the label. While the basic ingredients look reasonable, and it says that it’s designed mimic food a balanced “wild caught prey” diet, it doesn’t seem designed to guarantee a cat is getting the amounts of every nutrient they need to meet or exceed the AAFCO standards (which are supposed to be the minimum a cat needs for survival on a diet long-term). thanks for the reply!my cats are currently on call of the wild. and its good to know i should be thinking of something to alternate them with. I was told that means its not meant to be fed alone as a complete diet. It means only use it to supplement, or only use it by itself as a meal on occasion. Hi Lora, does it mean it’s safe to be used as a supplement to raw meat? Hi Liz, thanks for addressing these important nutritional issues with a raw diet. It is reassuring to those of who have chosen raw, that we are doing the right thing. After adopting my cat 3 years ago, I read up on feeding cats, and what I learned convinced me to switch. I transitioned my little one to a raw diet, made with Feline Instincts. My cat took to it easily and she loves it! I also feed her some of those cold pasteurized frozen pellets from Natures Variety and Stella&Chewy. What’s your position on these types of raw food? Thanks Hal. Yes, I do think those raw ones are good – I believe they use High Pressure Processing (HPP), which preserves the enzymes while eliminating bad bacteria. You are making me realize that i removed Nature’s Variety raw from from the Today’s Best Cat Food page when they changed their formulas and introduced the pellets – ONLY because I needed time to go back and analyze what the heck they did. I thought maybe they changed it to just snacks, not a balanced AAFCO-measured meal. And then I forgot to add them back! An oversight. They look fine to me and I like that Nature’s Variety is still an independent company; has not been bought out. I believe Stella still is as well.